In today’s technology dependent world, the computer science field is growing quickly and the number of candidates for these degree programs is on the rise. Students who pursue a computer science degree will learn the technical skills necessary to pursue careers as researchers, web and software developers, and information security specialists. This guide allows prospective computer science students to compare their degree options from the associate through graduate level, along with career outlook and salary information. Blake Johnson Gilmore is a sophomore at the University of Nevada, Reno. Hailing from Henderson, Nevada he began his college career with a major in education, but has since shifted his focus to computer science. In his short time at the university, Gilmore has managed to find himself on the dean’s list every semester since his arrival in the fall of 2014. Earning a degree in computer science can give students the opportunity to enter one of many careers in areas such as web development, cyber security or computer engineering. Many schools now provide computer science degrees and programs to keep up with the growing demand for experts in this field. 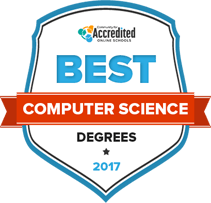 We’ve carefully examined computer science programs – both on-campus and online – and ranked them based on our comprehensive methodology to create the list of 2017’s Best Computer Science Degrees and Programs. Configure your future at one of the top-ranked institutions below. Computer science degrees can be found at every educational level from associate degrees to PhDs. Most programs combine the study of theory with the application of computer science. Whether pursuing an undergraduate or graduate degree, some programs may offer the ability to specialize in subjects like electrical or computer engineering, cyber security or web development. In a field that is constantly evolving, getting the right education can help computer science students and professionals stay ahead of the curve. While computer science is a growing field with numerous career avenues, it’s not for everyone. If you’re looking for a degree program that involves working with computers, mathematical reasoning and analytical problem-solving, below are a few similar programs that may suit your interests and career goals. Similar to computer science degrees, information technology focuses on the study of web design and creation of network architectures. Students can also explore specialties like security administration, customer support and computer animation technologies. If a major that allows for different applications in technology beyond computers seems more interesting to you, it may be beneficial to take a look at engineering. These programs generally offer specializations like electrical and biomedical engineering. In a mathematics degree program students learn about the various ways the systems of mathematics can be used to gain insight into human behavior and the world at large. This degree allows students to pursue careers as actuaries, statisticians or even financial analysts. Receiving a degree in computer science allows graduates the opportunity to excel in a highly technical and competitive field. With computer science degrees being offered through associate, bachelor’s, master’s and PhD programs, sifting through all of the different options and schools can be overwhelming. When comparing various degree programs, it’s important to consider your career goals and pick the program best suited to achieving them. Read on for a comparative overview of degree programs at each level. Often considered a method of entering into a baccalaureate program, a computer science associate degree is an ideal program for those who want to enter the field as quickly as possible, or who may want another route to pursing a bachelor’s degree. In order to be considered for the program, students must have a high school diploma or GED equivalent, in addition to taking entrance exams and completing the application process. Computer science associate degree programs typically require 60 credit hours and focus on familiarizing students with the basics of computer programming, algorithms, web development and database applications. Course offerings for associate degree programs are geared toward giving students the tools they need to gain entry-level positions in the industry. Below is a sampling of some typical courses in an associate degree program. Students will receive the foundational knowledge necessary to understand the information technologies or computer-human interaction in addition to studying the basics of information management, programming and networking. Focuses on developing the critical thinking skills of students as it relates to computers in problem solving. It will focus on human interaction with technology, and the impact it has on learning. Students will learn about Internet concepts, network protocols and client-server communications and how those concepts relate to web design in practice and in theory. Introduces students to COBOL programming language, and covers input-stream, data input, printer output, alphanumeric and numeric editing. Bachelor’s programs in computer science are ideal for students starting college directly after high school, or are otherwise able to dedicate the time to a demanding course load. For admission, students must have earned a high school diploma or GED equivalent in addition to taking entrance exams such as the SAT and ACT. During the course of an undergraduate education, students can expect to learn about engineering, programming and the theory of computer science in approximately 127 credit hours. Bachelor’s programs may also allow students to specialize in a particular field such as Human-Computer Interaction or Artificial Intelligence. There are a variety of undergraduate courses that help students learn skills in everything from programming to theory. Below are a few examples of courses that students can expect to take at this level. Computer scientists need to have a firm grasp of the mathematical tools and concepts that shape the field. This course familiarizes students with the logical notations used to express mathematical arguments. Covers logical reasoning, operations and networks and contemporary applications. Students will learn about algorithmic complexity analysis, recurrence relations and the master method in order to understand and analyze data structures and algorithms. Artificial intelligence is becoming ubiquitous in today’s world, and this course teaches students how to identify issues as well as develop AI technologies. Receiving a graduate degree in computer science whether it be a master’s or PhD is an achievement that can set professionals apart in this competitive field. Graduate-level studies are typically rigorous programs that take a significant amount of time to complete. A graduate degree program can be very rewarding for those looking to become highly specialized in their field. During the course of the program students can expect to complete advanced computer science courses and an original research thesis. For admission, they generally require students to receive high scores on graduate entrance exams and a strong undergraduate GPA. Prospective doctoral students should keep in mind that they must establish candidacy for a program before they are admitted. Graduate programs offer advanced coursework that are meant to challenge students and further the field. Below are some examples of common graduate courses. Teaches students about the importance of Java Script and how to understand its elements to achieve program idioms. Students will perfect their knowledge of secure computation, session-key distribution, electronic payment and one-way functions. Students will learn about the algorithms necessary for computer communication network concepts, protocols and architectures. Students will be exposed to a brief introduction to corpus linguistics and how to use that information to operate and install speech recognition software. Not all computer science programs are the same. Before committing to a degree path, students should make sure that they meet the specific school and program admission requirements. In addition to knowing that you are the right student for the program, it’s important to know that the program is right for you. Finding a computer science program that meets your academic and career goals should be a top priority for any new student. Accreditation is vital to gaining a worthwhile education as it shows employers that graduates completed a program that has met national standards of curriculum and rigor. When searching for a computer science program, look for accreditation from the Accreditation Board of Engineering and Technology, or ABET. Receiving a degree is a financial commitment, so making sure that an institution has a strong financial aid program for its students is vital to making smart investment in your education. Before committing to a school, research scholarships, review their financial aid requirements and fill out the FAFSA before the June 30 deadline. A university can be a perfect place to build networks for post-graduation life. Though talking to professors and peers is one way to meet fellow aspiring professionals, check to make sure that the institution of your choice offers a student chapter of a professional organization or otherwise demonstrates a commitment to helping students meet other professionals in the field. Along with a college education, holding certifications can prove to employers that you have the specialized knowledge and ability to work a certain job. In the computer science industry, there are opportunities for certifications that test aptitude for specific programs, networks, and job functions such as those offered by Cisco, CompTIA, and Microsoft. Looking for a degree program that adequately prepares you for these exams can get students on the right track to start their careers. It’s important to keep in mind that different institutions have varying baseline requirements for computer science degree programs. Before applying to a program, be sure that you meet the school’s pre-requisites, whether they be previous coursework or GPA minimums. Part of meeting a program’s pre-requisites and gaining admission to your ideal school is ensuring that you score well on entrance exams. If looking at an undergraduate program register for the SAT or ACT, but if looking to enroll in a graduate program you’ll have to take the GRE. Earning a degree in computer science can open the doors to a variety of job specialties in the field. Having a career goal in mind can help students chose the right courses, specializations and internship or research opportunities during the course of their education. The following outlines a few potential occupations for computer science graduates of various degree levels. Software developers design applications, systems and programs for computers and other devices. They also work to maintain the software they create through upgrades and routine testing. Computer network architects work to design data communications networks such as local area networks (LANs), wide area networks (WANs) and intranets. These professionals implement hardware and software solutions in order to build reliable, secure networks for their organizations. Computer and information research scientists are responsible for studying and inventing new ways to solve complex computing problems for business, medicine, science and other fields. IT managers are responsible for planning, coordinating and directing computer related activities in their respective organization. They must also determine a goal for their organization’s department, and implement the computer systems necessary to achieve it. In order to protect an organization’s computer networks, information security analysts must stay up-to-date with IT security technology and trends. They protect sensitive information with strategies like firewalls and data encryption, while also monitoring and responding to cyberattacks. Computer science can really go anywhere at this point. The field is always evolving to areas that haven’t been thought possible before. At the same time, computer science is an extremely popular field, and whether the aspiring computer scientists make it or break it, I believe that [it] can handle a large influx of workers. Working with other computer science professionals to achieve a common goal is an integral part of the job. Whether it be writing complex code or finding solutions a difficult research problem, collaboration is a skill that shouldn’t be overlooked. Solving difficult problems in new and unique ways is a calling for computer scientists. Knowing how to tackle highly technical problems in ways that haven’t been thought of before is a trademark skill of a successful computer science professional. It’s also vital that computer scientists are able to anticipate potential bugs in software and correct them before they hit the market. It’s also valuable to be able to predict the issues that a customer may face in order to help them more efficiently. Becoming a computer scientist relies heavily on a student’s ability to think critically about complex issues in code. They must be able to use math in order to solve problems logically and effectively. While it may seem that computer science is a relatively solitary profession, professionals are often still required to provide customer and personal support to those needing computer help. Knowing how to effectively provide customer and personal service gives professionals an edge in maintaining client relationships. Programming and coding is highly dependent on the specific order of information a computer needs in order to complete a task. Professionals should be able to arrange sets of actions logically.